Saturday, November 11 is a day set aside to honor our country’s Veterans of War. Today I am using this space to honor American Women Veterans. More than 35,000 American women served in the military during World War I.
Upwards of 25,000 American women between the ages of 21 and 69 served overseas during World War I. They began going in August of 1914—at first singly or with a few companions, later with service organizations, and lastly at the request of the U.S. government. Although the largest number were nurses, women served in numerous other capacities – from administrators and secretaries to telephone operators and architects. Many women continued to serve long after Armistice Day, some returning home as late as 1923. Their efforts and contributions in the Great War left a lasting legacy that inspired change across the nation. The service of these women helped propel the passage of the 19th Amendment, June 4, 1919, guaranteeing women the right to vote. More than half of the women who served in the U.S. armed forces in World War I – roughly 21,000 – belonged to the Army Nurse Corps. The U.S. Army Signal Corps recruited and trained more than 220 women – best known as the “Hello Girls” – to serve overseas as bilingual telephone operators. Women served in large numbers in civilian welfare organizations both at home and abroad, including the American Red Cross, YMCA, and Salvation Army. The National Service School is organized by the Women’s Naval Service to train women for duties in time of war and national disaster. Large numbers of civilian women worked in the manufacturing of munitions. The Army Ordnance Corps contracts women clerks to support its operations. The Army School of Nursing is authorized as an alternative to utilizing nurses’ aides in Army hospitals, May 25. Although the idea of women in the Army other than the Army Nurse Corps was not completely abandoned following World War I, it was not until the threat of world war loomed again that renewed interest was given to this issue. With the rumblings of World War II on the horizon, Congresswoman Edith Nourse Rogers of Massachusetts states, “I was resolved that our women would not again serve with the Army without the same protection the men got.” Consequently, the creation of the Women’s Army Corps is one of the most dramatic gender-changing events in American history. Women Airforce Service Pilots (WASPs) were the first brave women to fly American military aircraft. They forever changed the role of women in aviation. Women step up to perform an array of critical Army jobs, “to free a man to fight.” They work in hundreds of fields such as military intelligence, cryptography, parachute rigging, maintenance and supply, to name a few. Additionally, more than 60,000 Army Nurses serve around the world and over 1,000 women flew aircraft for the Women’s Airforce Service Pilots. Through the course of the war, 140,000 women served in the U.S. Army and the Women’s Army Corps proved itself vital to the effort. The selfless sacrifice of these brave women usher in new economic and social changes that will forever alter the role of women in American society. Women’s Army Auxiliary Corps (WAAC) is established, May 14. WAAC women work in primarily four fields: baking, clerical, driving and medical. Within one year, this expands to over 400 jobs. The 149th Post Headquarters Company becomes the first WAAC unit to serve overseas. WAAC converts into Women’s Army Corps (WAC), July 1, giving women military status, equal benefits and pay, and the same disciplinary code as men. A WAC recruiting campaign in Puerto Rico results in 200 women being selected from a pool of the 1,500 applicants. They were sent to Fort Ogelthorpe, Ga. for training. The 6888th Central Postal Battalion is the first and only African-American WAC unit deployed overseas during World War II. Japanese-American women are recruited to work in the Military Intelligence Service Language School at Fort Snelling, Minn. Other Nisei WACs receive training in clerical, medical and supply positions. The period immediately following World War II was one of uncertainty and constant change for the Women’s Army Corps personnel. The original intent of the WAC was to last for the duration of the war plus 6-months. However, this post-war period also marked great strides for integrating both the WAC and the Army Nurse Corps into the Regular Army. Women’s Armed Services Integration Act creates regular and reserve status for women in the Army, June 12. The first WAC Training Center officially opens at Camp Lee, Va., Oct. 4. The Army eliminates the 10 percent racial quota, ending racial segregation in the WAC. Company B, previously an all-black unit, completes its last class of segregated training, welcoming desegregation at Camp Lee. Army nurses were the only military women allowed into the combat theater during the Korean War. The involuntary recall of reserve officers for the Korean War marks the first time women are summoned to active duty without their consent. After the Korean War, and with the move of the WAC Training Center and School to Fort McClellan, Ala., the focus of the Corps shifted to the examination of management practices and the image of the WAC. The WAC directors in the 1950s and 1960s sought to expand WAC by increasing the types of jobs available in the Army, and by promoting the Corps to not only possible recruits, but also to their family members. The leadership worked hard to act as role models and to instruct the women to respect the Corps, take pride in their work, and ensure that their personal behavior and appearance was always above reproach. Their success was marked by a request from the Army chief of staff to lift the recruitment ceiling on the number of women. It was also during this era we see the removal of restrictions on promotions, assignments and utilization. First Army green uniform issued to women in March, marking a step toward equality between men and women Soldiers. First WAC officers assigned to Vietnam, nearly a decade after U.S. involvement in the war. WACs allowed to serve in the Army National Guard. Public Law 90-130 equalized promotion and retirement rules for all military officers. Sgt. Maj. Yzetta L. Nelson becomes the first WAC promoted to command sergeant major, the highest enlisted rank, March 30. First three women graduate from the Army War College in May. Brig. Gen. Elizabeth P. Hoisington and Brig. Gen. Anna Mae Hays become the first two women in the U.S. Armed Forces to achieve the rank of brigadier general, June 11. All MOSs open up to women, except for 48 combat or hazardous duty MOSs. Women allowed to command men, except in combat units, for the first time in history. The Vietnam War, the elimination of the draft, and the rise of the feminist movement had a major impact on both the Women’s Army Corps and Army Nurse Corps. There was a renewed emphasis on parity and increased opportunity for women in uniform. Mandatory defensive weapons training initiated for enlisted women, June 1975. Women are permitted to be admitted to all service academies. Women authorized to serve the same length of overseas tours as men, Jan. 1. The first combined gender class for a military occupational specialty, or MOS, school begins, July 8. Men and women integrate in the same basic training units in September. WAC is disestablished as a separate Corps of the Army. The disestablishment of the WAC and the integration of women into the Regular Army paved the way for women to continue breaking down gender barriers. In the ensuing years, the Army was called upon to respond to regional conflicts, natural disasters and humanitarian crises around the globe. The roles of Army Women are tested and re-defined during these contingency operations. In November, 2nd Lt. Marcella Hayes becomes the first black female pilot in the U.S. Armed Forces when she graduated from Army Flight School. The first women cadets graduate from U.S. Military Academy, West Point, N.Y.
More than 100 women participate in Operation Urgent Fury, Grenada, the first assignment for women since the disestablishment of the WAC. Women are allowed to fly helicopters for the first time in an armed conflict. Capt. Linda Bray becomes the first woman to command U.S. troops in combat during Operation Just Cause, Panama. In the largest call up of women since World War II, over 24,000 women served during Operation Desert Shield/Desert Storm. 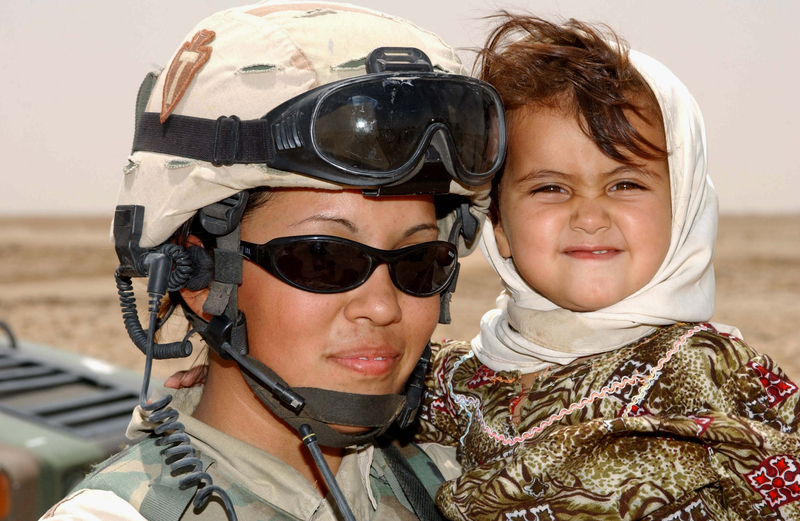 The terrorist attacks of Sept. 11, 2001 mark a pivotal changing point for Army women. As the Army’s mission changed on the battlefields of Iraq and Afghanistan, so did the roles of women in its ranks. With the Global War on Terror campaign, there was a rapid expansion of jobs and change in roles for Army women. Beginning In 2016, women have the equal right to choose any military occupational specialty including ground combat units that were previously unauthorized. Sgt. Leigh Ann Hester becomes the first woman in U.S. military history to earn the Silver Star for direct combat action, June 16. Col. Stephanie Dawson, the first female brigade commander in the New York Army National Guard, takes command of the 369th Sustainment Brigade, known as the Harlem Hellfighters, Nov. 16. Gen. Ann E. Dunwoody becomes the first female four-star general in military history, Nov. 14. Secretary of Defense Leon Panetta ends the direct ground combat exclusion rule for female service members, and integrates women into combat units, Jan. 24. Secretary of the Army John M. McHugh signs a directive authorizing more opportunities for women – approximately 33,000 position – to serve in a wider range of roles that previously were closed to women, implemented April 8. Army Directive 2016-01 opens more than 4,100 positions to women in the U.S. Army Special Operations Command, eliminating the separate assignments, Feb. 25. Capt. Kristen Griest and 1st Lt. Shaye Haver become the first women to graduate from Ranger School, Aug. 21. Guidance to prepare for full integration of women by Jan. 1. All military occupations and positionsbecome available to women, as long as they qualify and meet specific standards, beginning in January. The information in this article came from the U.S. Army site: Women in the Army. Please feel free to add a link to your post about a special Veteran in your life in the comments section. Thank you Annika for always taking the time to read and comment. Wishing you blue sky and sunshine this weekend. Thank you Annika for reading and commenting and your great support. Some remarkable women there. I’d never heard of them before, so I’m grateful for the education! Next step, female President? Some might say it’s a pity that hasn’t already happened…. Some would say, including me. I hope to see it in my lifetime. So do I. But, having said that, I’m not a fan of either of our two female Prime Ministers! Me too Bernadette, me too! What a thorough and enlightening post about the remarkable women who have contributed so much to our country and the military. I’m so proud of nurses reading through this as they were pivotal and brave in helping to advance women’s roles. What an amazing piece, Bernadette! I learned so much ! Thank YOU for sharing this and know that I am going to share with others. Women play a very important part in our world and in the military and you have done a fabulous job of compiling a wonderful tribute. Thank you! This is wonderful piece, Bernadette. A worthy tribute to our women in the military. Thank you for being such a loyal supporter. Enjoy your holiday. The feeling is mutual, Bernadette. How interesting! We’ve come a long way baby……………..
And still have a long way to go that’s for sure. Thanks for taking the time to read and comment. Enjoy this weekend and thanks for always reading and supporting me. Lots of wonderful women here, women who often are not recognized for their contributions. Great job in pulling it all together, thank you! Bernadette, another outstanding piece of research and writing. Thank you for sharing. Thank you for providing a wonderful list of women who have broken barriers and served our country. This is really awesome…loved reading! Bernadette, This note is not about this particular post, but to check on you, and to let you know I am thinking of you. 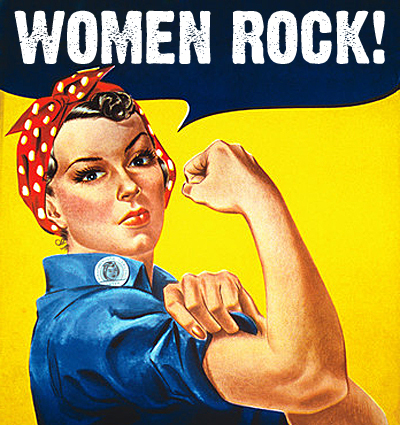 I want you to know that the followers of your blog consider you a Woman That Rocks, and a ‘rock’ for many of us as you continually support women. We want you to know that as you have lifted us up, we are here to lift and carry you when you need us. Thanks so much for your note. We had a Celebration of Andrew’s life on Sunday and it was beautiful. I am very slowly recovering some energy. I never realized how much sorrow saps your energy and, of course, your concentration. I never realized how many good, good women I would come to know when I started my blog and I count you among the best. A terrific historical document, Bernadette. We should never forget the bravery and sacrifice of those who have protected our way of life, and continue to do so. I love this post, Bernadette. It is a wonderful tribute to women in the military and women, in general. So interesting. Such brave, selfless women. You have really put a lot of work into this post. Thank you ! Unique and innovative post! Really enjoyed it!